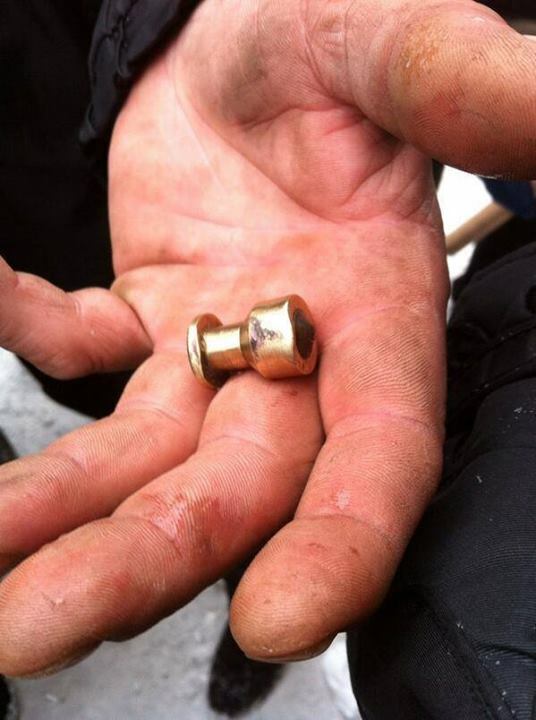 Over the past few days, various journalists, aid workers, and others have documented the presence of brass shotgun slugs in the streets of Kiev. One eyewitness ARES spoke with describes one such projectile having been fired into a crowd he was standing with. Two images depicting the fired projectiles (see below) were posted on Twitter by Christopher Miller and Oleksandr Aronets, both on the 22nd of January. The projectiles shown are specialised armour-piercing (AP) 12 gauge shotgun projectiles, believed to be developed and produced by the Spetstekhnika (‘Specialised Equipment’) design bureau, a facility located in Kiev and associated with the Ministry of Internal Affairs. The projectiles are comprised of either a brass or aluminium slug and a core of (likely hardened) steel, designed to act as a penetrator. The design of the projectile has been optimised for stopping vehicles, and the cartridge is referred to as a ‘car stopper’. 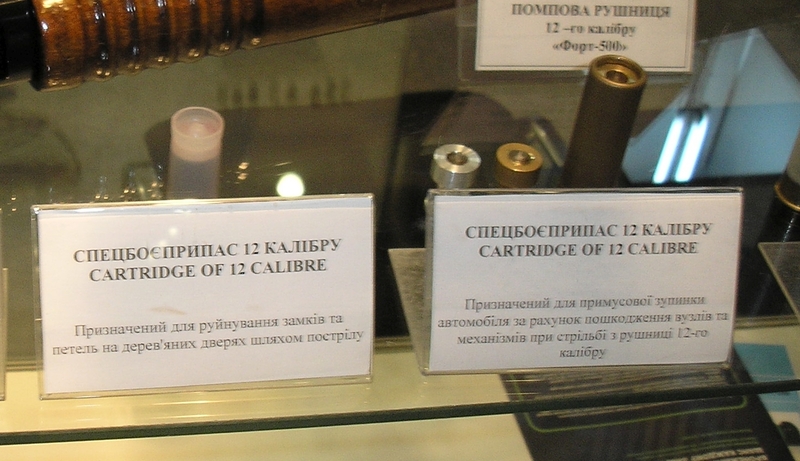 The image below (provided by a confidential source) was taken at the Weapons and Security expo in Kiev, in 2013. Both the brass and the aluminium slugs are pictured. Roughly translated, the sign reads “designed for the forcible stop of a vehicle by damaging parts and mechanisms while shooting a 12 gauge weapon”. 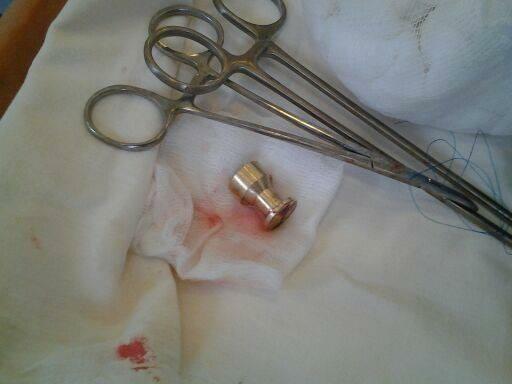 The image below, provided by a fellow IAA member, shows an example of a complete cartridge, an unfired projectile, and a wad column. It should be noted that the cartridge case pictured, with a headstamp indicating production by Baschieri & Pellagri Spa of Italy, is commercially available and does not indicate where the loaded cartridge was produced. Shotshells are particularly difficult to identify from headstamps alone, as a range of third-party producers can be involved in the supply of shotgun cartridge cases (hulls and brass heads) to manufacturers of complete cartridges. Shotshell cases supplied on government contracts often follow commercial marking practices, making them difficult to distinguish from cartridges used for civilian purposes. Contrary to some information circulating online, these slugs are not Blondeau type projectiles. Additionally, the larger ‘end’ of the projectile is the forward portion. There also appears to be some confusion as to the purpose of these cartridges, with the some sources claiming they are primarily used as breaching rounds. 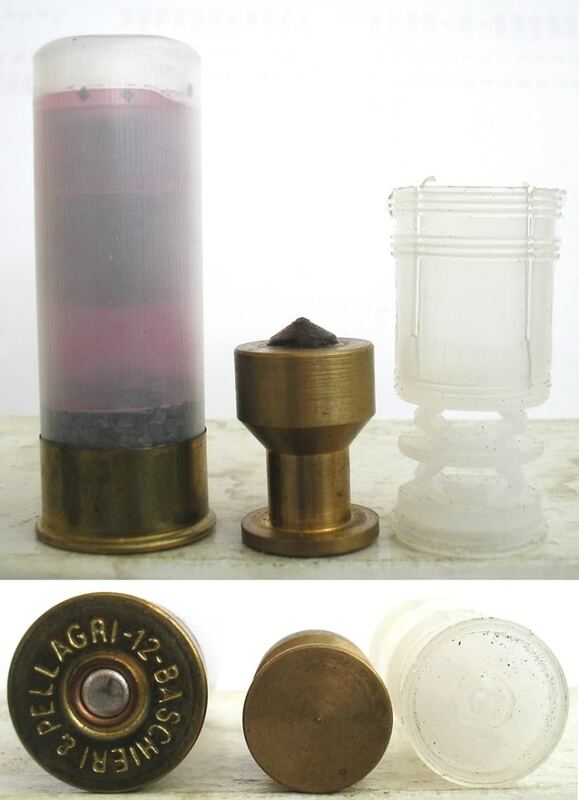 Unlike dedicated breaching cartridges which typically make use of frangible projectiles of sintered metal powder, these slugs are not intended to disintegrate upon impact. Suffice to say, these projectiles are lethal, and would not generally be fired in the course of a crowd-control action. Firing such cartridges against human targets certainly constitutes lethal force and, whilst effective within range constraints, would be an unusual choice. Other cartridge types would be more readily available, cheaper, and more effective if lethal force was required. My thanks to Christopher Miller and a confidential source for their assistance with this piece. Topmost image copyright AP Photo/Sergei Grits. That are not really new cartridge types. Belgian Company FIER has several of this types produced in 2005/2006, as many other companies, and Russia uses a similar type with Alu-sleeve and a TUNGSTEN Core inserted. Thanks, Petrusic. We’ve seen a few like this, yes. Spot on with this write-up, I really believe this amazing site needs far more attention. One possible reason the police used such rounds during the Maidan uprising might be that some protesters had aquired riot shields from earlier clashes with the riot police and were advancing up the streets behind those shields. 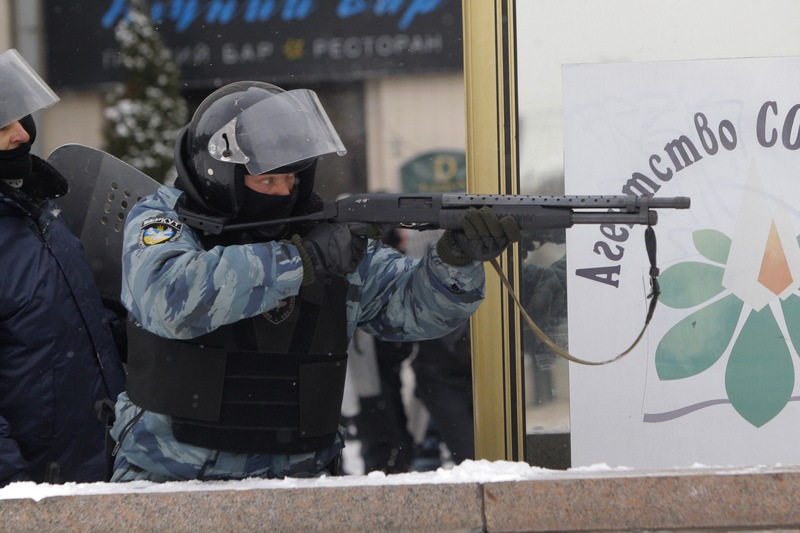 Unlike riot shields in Western Europe, eastern european riot shields are typically made of sheet steel, with rows of holes for vision. Video shot from the uprising does show police officers shooting through these shields with assault rifles and sniper rifles, but if an officer equipped with a shotgun encountered protesters behind riot shields his only option for penetrating such shields might have been these car stopping rounds. And that would propably be the reason they were issued such projecties in the first place. If the protesters tried to drive a vehicle through police barricades, this ammunition would be the right choice to stop that vehicle.